Installing the plugin is extremely simple. Simply search for Top 10 in your Plugins » Add New screen and hit Install Now. Find the widget under Appearance » Widgets and drag it to the sidebar you want and the plugin will start displaying the popular posts. Top 10 automatically tracks all your posts, pages and custom post types on your WordPress blog. Top 10 comes inbuilt with a beautiful default style and also gives you several options to customise them! Top 10 is fully compatible with major caching plugins including W3 Total Cache, WP Super Cache, etc. Top 10 is currently being used on 30,000+ WordPress blogs. 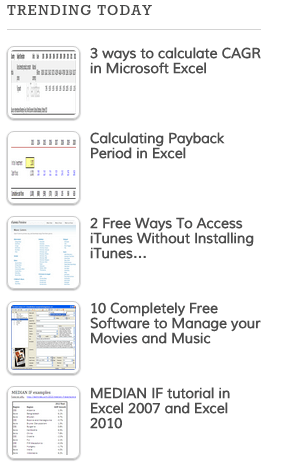 I am using top 10 popular list and it is really great plugin. I used it on side bar, then I wanted it on the top page too. So I asked a question to Ajay. Next day, he answered to my question, and started to try and error work together. He never gave up until it was done. Now I am using top 10 in the side bar as well as in the top page with horizontal top 10 lists. Thank you Ajay, you are really great person and programmer. This is without doubt the best plugin for popular posts !! I have used all available but this by far is the best !! It has an incredible performance and a first author support !! 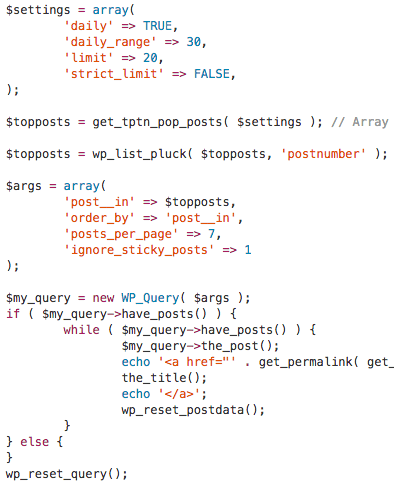 I needed to do a custom query for a custom post where i will also pull some post_meta and the author informed me the details of how it would be possible !! Grateful for this great plugin !! When Top 10 started giving a strange warning to our readers, I wrote for support and the author wrote back IMMEDIATELY, two times. That’s unbelievable to me, for a free plugin. I’ve searched for a good Most Viewed plugin in many ways, and this is the best one; simple to set up, but tons of options. Thanks! A fantastic, flexible plugin that does what it says in a logical, efficient way! Also, Ajay’s support for the plugin is fantastic (see the Support thread for examples). Definitely add this if you’re needing a “popular posts” feature for your site! Time to start telling your visitors what’s trending on your site today!